Introduce friends and family to the Next Generation of Steak with a Son of Steak Gift Card. Just choose your amount, and whether you want it to be delivered via email or text message. Then the lucky person just needs to show their mobile to spend it. Where can I buy Son of Steak eGifts? eGifts are available to purchase online. If you order online you can choose whether your gift card is received by email or by text message (eGift). You can also buy plastic gift cards from our restaurants. Just pop into your nearest Son Of Steak and speak to a team member. Who can I send an email or text message eGift to? Email eGifts can be sent to anyone with a valid UK email address. Text message eGifts can be sent to anyone with a UK mobile number starting with 07. Both email and text message eGifts can be scheduled for delivery at a time and on a date of your choice. When I order an email or text message eGift for a friend, how will I know it has been sent? After you've made payment, you should receive an email detailing your order and confirming the delivery of your eGift. What if the eGift is not received? Where can I spend Son of Steak eGifts? 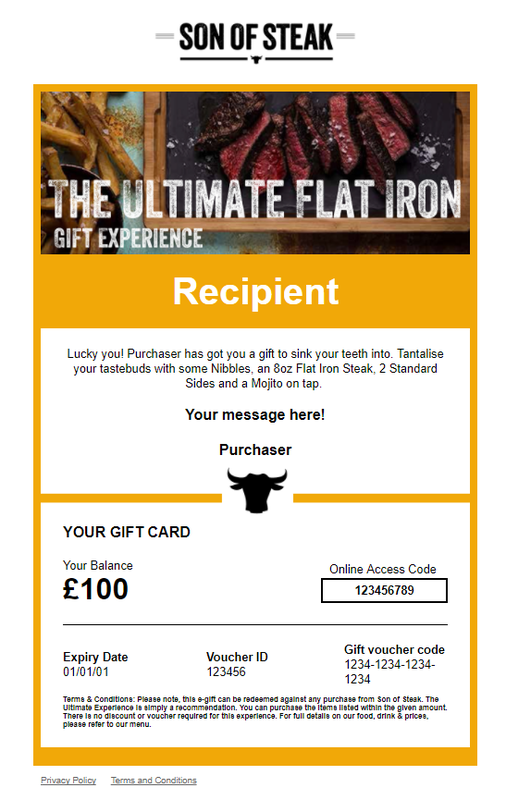 Son Of Steak gift cards (whether plastic, email or text message) are valid at any Son Of Steak restaurants in the UK. How do I spend an eGift card received by email or text message? Do I have to spend all the money on my eGift in one go? Not at all. If there is any remaining balance on your eGift, feel free to come back and spend it before the expiry date. Our gift cards are valid for 14 months from the date of purchase. Where can I find out what the remaining balance is on my eGift? To check the balance on your eGift, please click here and follow the simple instructions. I have an issue with my eGift, but I can't find the answer here. Can I order large quantities of Son Of Steak gift cards? Certainly. Simply call the gift-card team on 0121 498 7071 – the line's open from 10am to 4pm Monday to Friday. Where can I find Son of Steak's terms and conditions? 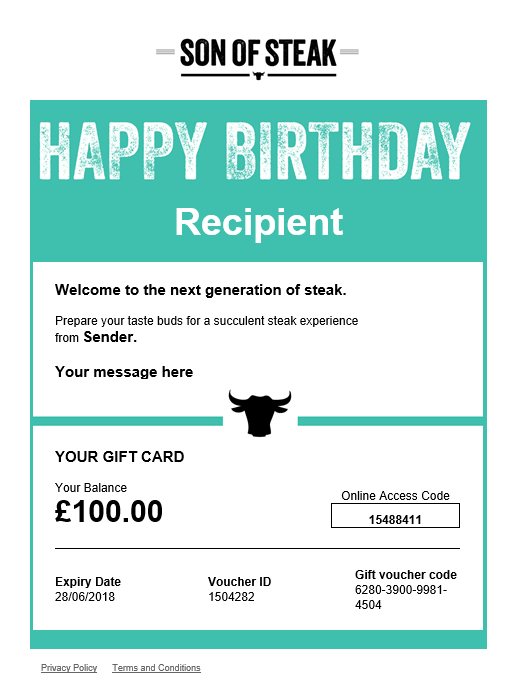 This website and orders for Son Of Steak gift cards made through the website are managed by our third party service provider, Eagle Eye Solutions Ltd., 5 New Street Square, London, EC4A 3TW, registered in England company number 04745717. The gift card customer is contracting with Eagle Eye Solutions Ltd. and the payment for the gift purchase will show as Eagle Eye Solutions Ltd. on the bank statement. Eagle Eye Solutions Ltd. will be responsible for gift card refunds. 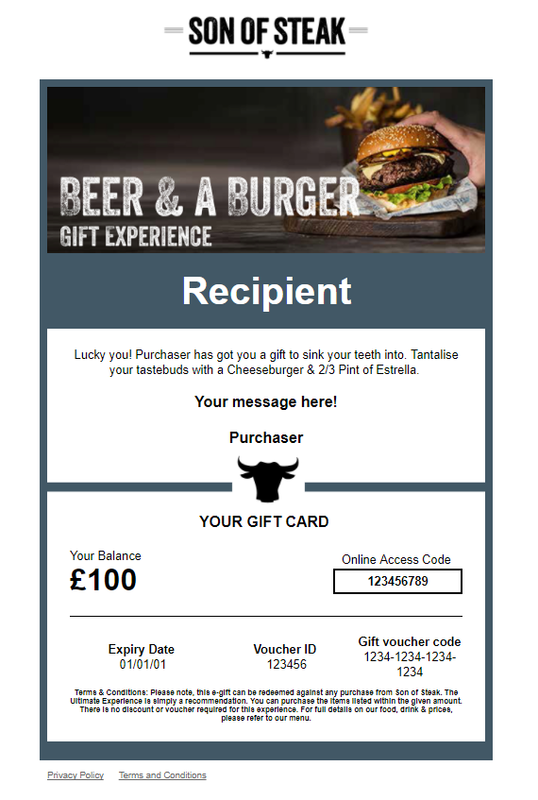 Mitchells & Butlers gift care team can be contacted via email gift.cards@mbplc.com or by phone 0121 498 7098. To contact Eagle Eye Solutions Ltd., visit their website.